Update: As of 5 p.m. there have been 71,849 calls into Election Protection’s 866-OUR-VOTE Hotline. The trends throughout the day include confusion over voter ID requirements in multiple states; long lines at the polls in part due to early voting restrictions; and inadequate preparation throughout the country—not enough voting machines or polling officials—for a large voter turnout. One of the most significant updates include a number of reports coming out of Pennsylvania—specifically Philadelphia and Pittsburgh—that voters have been wrongfully removed from the voting rolls. Election Protection headquarters—the nation’s largest non-partisan voter protection coalition—provided its first update on Election Day voting irregularities. 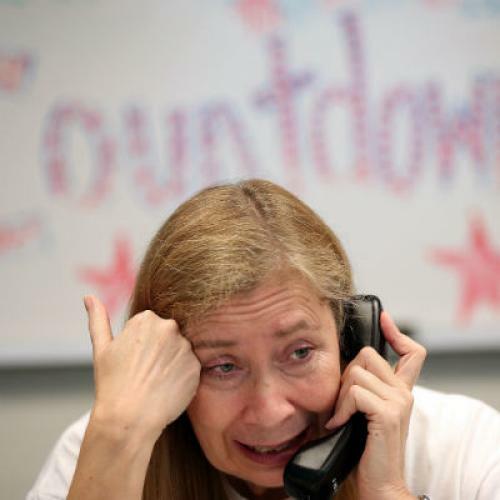 As of 11:00 a.m., the coalition said it fielded 35,000 calls about voting problems throughout the nation, on pace to reach the 100,000 it received on Election Day 2008. The coalition has nearly 10,000 volunteers on the ground throughout the country monitoring for voting issues, and another 50 volunteers in D.C. fielding phone calls from other volunteers and directly from voters. A significant number of the calls have been coming from voters displaced by Hurricane Sandy in New York and New Jersey—5,400 from New Jersey and 4,000 from New York. Another major source of complaints has been students and first-time voters who encountered voter registration issues; showing up at the wrong polling location, not properly registering and not seeing their names on the voter roll. Election watchers will also be looking to Election Protection to see how a slew of new voting laws in states such as Virginia and Ohio are playing out. So far the biggest problem has been seen in Pennsylvania—a state that received a lot of attention for its unsuccessful attempt to adopt a strict voter ID law. In Pennsylvania, there has been a lot of confusion over the state’s voter ID law, which never actually took effect. State legislators had tried to pass a strict photo ID requirement, but after much partisan debate, a judge blocked the law in early October, saying that voters did not have enough time to prepare for the new requirements. Now, there are reports that poorly trained polling officials are turning away voters who do not present an ID—a violation of the law currently on the books. The poll workers are required to ask voters for their IDs, but if they do not have identification they are still allowed to vote. Eric Marshall, co-leader of Election Protection, said reports indicate that African-American voters are being targeted at higher numbers. It is still unclear how many voters were actually turned away, but the complaints coming in from the state make it clear that confusion is rampant. The only word to describe the experience in New Jersey is “catastrophe,” said Barbara Arnwine, Lawyers’ Committee for Civil Rights Under Law—a situation which can largely be attributed to the aftermath of Hurricane Sandy. Due to a large number of people trying to request and submit ballots online, county computer systems have been overwhelmed, leaving many voters unable to receive or submit their online ballots. (New Jersey enacted a plan to allow voters displaced by Hurricane Sandy to vote via email.) The American Civil Liberties Union of New Jersey announced that it plans to file an emergency petition to a state Superior Court judge to allow people in Essex County to vote through the Federal Voting Assistance Program—a program that typically provides absentee ballots to residents living overseas or members of the armed services. In Cleveland, Dayton and Toledo some scanners are not working. Subsequently lines are long and emergency ballot boxes are full. Poll workers are reportedly putting the overflow ballots in a box intended for provisional ballots, prompting concern over the handling of these ballots. Wisconsin was not prepared for the high turnout today. There is a report coming out of a predominately African-American precinct in Milwaukee that the line to vote is 300-people long with only one working polling machine. Mimicking what we saw in early voting there, the lines to vote are long in Florida. The details are still unclear, but in Tampa there are reports of voter being sent from their correct polling location to a different location. This is likely for efficiency reasons, but if you are voting in the wrong location in Florida you must cast a provisional ballot, which has a significant chance of not being counted. These are the preliminary complaints and Election Protection still has to follow-up to determine the full impact and prevalence of each of these and more complaints that roll in throughout the day. But overall, leaders at the Election Protection coalition said the election process has been working for the majority of Americans. * Update: A previous version of this story said Nadine Smith, the executive director of Equality Florida, was reportedly not allowed to vote at her polling place in Hillsborough County. It has since been learned that she was not in fact turned away.